For a glimpse of 18th century life at the time of the American Revolution, join the 1st Ulster Militia for a day in the life of a militiaman. The original 1st Regiment, Ulster County Militia was composed of citizen soldiers from the area now within the boundaries of Kingston, Saugerties and Woodstock. 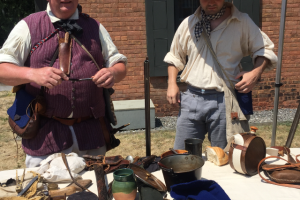 Members promote the education of the public as to military and social life in the colonial and Revolutionary War eras through demonstrations of everyday crafts and skills and the typical life of the militiaman. So join the 1st Ulster Militia, with special guests Don & Hella Beale from the British Brigade, as they bring history alive! Firearms demonstrations will be done throughout the day.